Click to watch the video! A few years ago I developed an iced-coffee habit. Cold brew was just coming in to some of the upscale coffee shops in our area, and I quickly got hooked. The problem was the damage this habit was doing to my wallet. At $4 – $5 per glass, it’s still an expensive purchase at my local café. 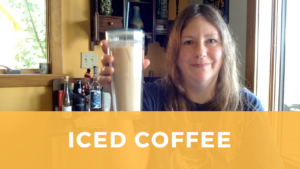 I soon started looking for an easy way to make my own cold-brewed iced coffee at home, and discovered it’s not difficult. You can use items you may have on-hand already, such as wide-mouth jars and coffee filters. If you do want to purchase a special cold-brew system, you can get anything from a reusable metal filter that fits inside a mason jar, to a fancy all-stainless system that will make huge batches. Cold-brew coffee systems come and go quickly, so I suggest just doing a web search to see what’s current and highly reviewed. Currently, I’m using the Toddy cold-brew coffee maker, which works just fine, and can make a lot of coffee concentrate at once. Down the road, I might replace this somewhat cumbersome setup with a space-saving reusable stainless filter. For now, my method for brewing iced coffee is as follows. Makes approximately 1 quart coffee concentrate, enough to last me 7-8 days. Grind your coffee on a coarse or French press setting. Add the coffee to your brewing vessel and pour in two or three cups of water. Stir to thoroughly moisten the coffee. Let the coffee brew at room temperature for 36 – 48 hours, stirring every 12 hours. Filter the coffee by either pouring it through a coffee filter or letting it drip out of a gravity system with a filter inside. Keep in mind that the coffee has to find its way through all the coffee grounds, so this process can take several minutes. Next, pour a small amount of fresh cold water through the grounds and the filter to rinse out the last bit of coffee extract. Store your coffee extract in the refrigerator, in an air-tight container to reduce oxidizing and off-flavors. To serve, fill a glass with ice, then add 20 – 30% coffee concentrate, 35 – 45% water, and 30 – 35% whole milk. You should experiment with the proportions, but remember that iced coffee will taste milder than a cup of hot-brewed coffee, so be sure you’re diluting the extract enough. Coffee concentrate will keep in the refrigerator for 7 – 10 days. You can use it for baking and brewing beer as well as making iced or hot beverages. Do you make your own cold brew? Leave us a comment and let us know your favorite method, brew system, style of coffee, or any other tips. Sarah is the owner/operator of Vermont Natural Sheepskins. She is an avid knitter and knitwear designer. She also enjoys cooking and gardening.